Your WHY verbalizes the driving force that moves you to success as you work your Virtual Franchise. It explains WHY you do WHAT you do. It inspires your Vision, what you and your life will look like as a direct result of living the life that was designed for you, and achieving your Goals. Use this worksheet (with your new team member) to help them discover their WHY. Every WHY leads to a HOW and a WHAT (watch Simon Sinek’s video below). Everyone knows WHAT they do (share Juice Plus+). Some know HOW they do it (sharing my story and using CDs, DVDs, on-line videos and events – key components of our business model, the Virtual Franchise). But very few truly know WHY they do what they do. Only those who know their WHY, and can communicate it, are able to lead and inspire others. Your WHY comes from the past. It begins as the sum total of your upbringing and experiences, which give birth to your core values and beliefs; it is WHO you are, and it is what INSPIRES you. Hence it is the reason you do WHAT you do, and it is the core of living an authentic life, where your WHY, your HOW and your WHAT are all in balance and perfectly aligned. The WHY is also the core of every successful company and leader in history. 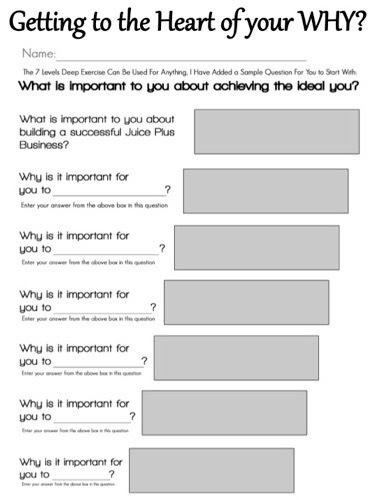 The Juice Plus+ Company‘s WHY, (their mission statement) unchanged for over almost 50 years, is “To build a stable and lasting company that will help as many people as possible to realize their dreams.“ They’ve done that very successfully and are a great example of being true to your WHY. The Juice Plus+ Company‘s (and our) HOW is “Inspiring Healthy Living Around the World”; this is the way we market Juice Plus+. This is also a perfect ‘starter’ WHY for many people joining our business, until their own personal, more powerful WHY becomes clear. When their true WHY is clear, this then becomes their HOW. The Juice Plus+ Company‘s (and our) WHAT is “Embrace; Share; Inspire; using Juice Plus+ through the Virtual Franchise”. It’s WHAT we do. It’s vital that our WHY, HOW and the WHAT all lead and connect to our customers’ WHY: “To take control of my family’s health”; to their HOW: “By using the tools and truth I can gather”; and to their WHAT: “My family and I taking Juice Plus+ every day, and making other healthy choices”. Juice Plus+ is the catalyst and primary tool in our customers’ hands, enabling them to take control of their health. So, our WHY, HOW and WHAT combine into “We help as many people as possible to realize their dreams by inspiring healthy living around our world, and by helping others to make Juice Plus+ the core catalyst for taking control of their health.” Do you think other people can understand, identify with and be inspired by that?! Now, read Jeff Roberti (“the $70 million man”) on The Power of Why. Next, watch this video – it explains everything – then read the book. Seriously!